Youths across all civilizations are the major drivers of the society. At the early stage of every revolution and civilization, the youth were the major “game-changers” who carried the burden of propagating change and advancement. They possessed clarity of purpose coupled with well-defined goals. With these two foundations, they were able to make all the difference in the world. Today, most youths lack clear goals and direction. They are entangled between ignorance and laziness, lust and licentiousness, societal ills and peer pressure. How then can such youths make a difference? 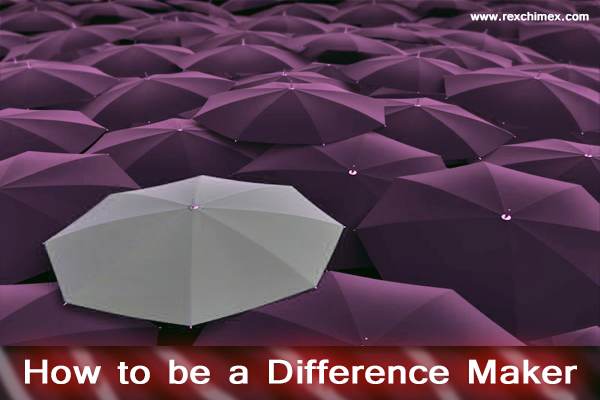 If your aim is to be a difference maker and to effect positive change in the society, you must learn to do things differently and correctly too. The soul is naturally lazy. Only discipline can make it upright. You must, therefore, struggle against the evil yearnings of your soul, and nourish it with the fear of God and continuous striving. Do the right thing at the right time, and do not engage in atrocities that will hamper your progress. As a youth, you need the right ideology to do things the way that makes a difference. Ideology refers to a system of ideas and ideals of which one believes and then acts on. This is the basis for success in this life and the hereafter. Without the correct ideology, efforts made will not yield any positive result no matter the amount of resources invested. A youth will be under God’s shade on the Day of Judgment simply because he grew up worshipping Him. As amazing as this appears, it requires a high level of consciousness. This is because the society calls to ungodliness, and considers devoutness out-of-date. Do not join them but rather make a difference by calling a spade a spade. Being able to organize your affairs with little or no supervision shows a great deal of maturity. It becomes easy to achieve when you plan your life well. Unfortunately, this is a major problem among many young people today. They are confused about what next to do at every stage of their lives, so they just muddle up things. Seeking knowledge should be from cradle to grave. Nobody is too young or too old to learn. Once you stop learning, you start dying and go out of date. Therefore, the need to be updated and be in the quest for knowledge is a welcomed development. As a young man or woman, you must be up-to-date with the events around you; your thought pattern must totally align with modern acceptable standards. You must always come up with ideas that will add value to your life and suspend Stone Age ideas capable of impeding your growth. You must be exemplary in the way you interact with others. Do not repel people with ill manners; rather call unto the path of your Lord with wisdom and good words. Learn to use kind words when correcting others; you are not yourself a saint. No one is perfect either. While time means MONEY in the west, it should mean Life to you. Whatever time we lose is lost from our limited life for which we are accountable. Be time and life conscious. Get money through the right means, so that you can live to enjoy the money you got and not wallow in sheer regret at the end of the day. Use your physical strength for productive work while you are still young and strong. You can only be a youth once in a lifetime. Nobody has ever eaten a better meal than that which one has earned with one’s own hands. Over-dependence should be frowned at and hard work encouraged. You cannot be fed forever, so think of how to start feeding others. As a youth, you are an ambassador of your family and the entire society, and a potential change agent. Your family and the society expect a lot from you and automatically confer this role upon you. You must, therefore, take full responsibility and play this role diligently. The expectation on you is great, so go all out, and make all the difference in the world.